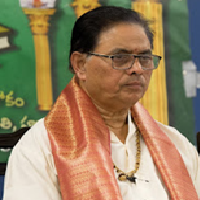 Sree Dhulipala Mahadeva Mani Garu is a professor at Andhra Yuvati Kalasala, Rajahmundry. He has a great wealth of knowledge and is an Avadhaani, as well as a very learned speaker on our Sastras, Puranas, and Vedas. Wanting to share the vast amount of knowledge he has accumulated, he gives many discourses and writes literature, both of which have been shared with the spiritual groups of Andhra Pradesh. He has also trained multiple young Avadhaanis in our vast Telugu literature.